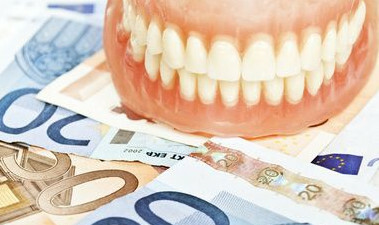 The costs of dentures and dental treatments at our dental practice Dental Planet in Rojales, close to Alicante and Torrevieja in Spain. Our receptionist is frequently asked for a price list. As a guide we put together an overview of our most important services and prices. It is very important to us that you can make a well-informed decision in regards to your teeth. Depending on what is most important to you, such as reasonably priced dentures, wearing comfort, durability, aesthetics, minimally invasive treatment, or conservative dentistry, the field dental medicine offers many possibilities to satisfy your individual needs. Through a personal interview we will explain all the pros and cons of a possible treatment solution – thus you can make an informed decision as to which treatment is best for you. We are able to manufacture low-cost crowns as well as high quality crowns. For example, you can pay 290€ per crown or up to 590€ for a porcelain crown. This doesn’t mean that the high quality option is overpriced. It’s more a question of “equipment”. A Ford Fiesta is not as expensive as a Mercedes S-class. As in the car industry, one can also find such distinctions in the field of dental medicine. However, dentistry does not offer the possibility of “test-chewing”. Nevertheless, a consultation can clarify the differences of the various treatment possibilities. One thing you always should be aware of: everybody can offer cheap work (we do too, if we have to), but is everybody capable of high quality work? We at Dental Planet want to provide the “Mercedes S-class” when it comes to your teeth but with reasonable prices. We offer a very inexpensive initial consultation for just 62 € (inclusive of digital panoramic radiography). 4 year warranty on dental crowns and bridges. 4 year warranty on removable dentures. As already mentioned, a valid quote can only be given after a thorough examination, and discussing all your options. If you have any further questions about our prices, please contact our receptionist. She is happy to help you. Dental Planet, your English-speaking dentist in Rojales, close to Torrevieja and Alicante in Spain.